If you enjoy the freedom of traveling without relying on full-hookup RV parks or using a generator, solar power may be an excellent option for you – that provides you with the independence you’re looking for. In this instructional class, you will learn about solar power and the different types of solar panels, as well how you use them. The solar configuration that is right for you will depend on how much boondocking you’ll be doing, how much battery power you need, and therefore how much recharging you’ll need. We’ll talk about the freedom that solar can give you, such as going out in the desert boondocking without being tethered to an electrical source or running the generator all night long. 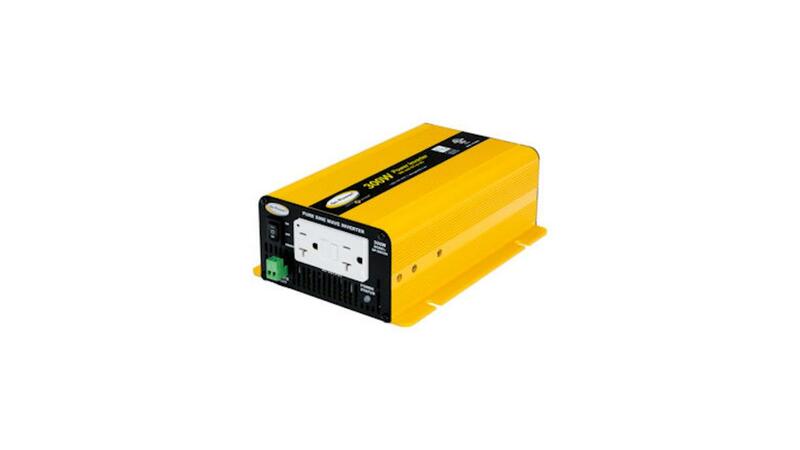 We’re going to talk about inverters and how it takes some of that 12-volt power that you’ve just recharged from your solar panel and use it to run a refrigerator or other electronics inside that normally would be 120-volt. You’ll also learn about the controller and how important it is to have something that will regulate how much recharge you’re going to get from your panel(s) down to your batteries so that you don’t overcharge them. We will also talk about battery capacity, it doesn’t do any good to have the best solar panels in the world if you have batteries that become sulfated and are not holding a charge. It’s important to understand your electrical needs so we will also talk about what runs on 12-volt inside the RV and how to make it run more efficiently so you don’t drain the batteries. 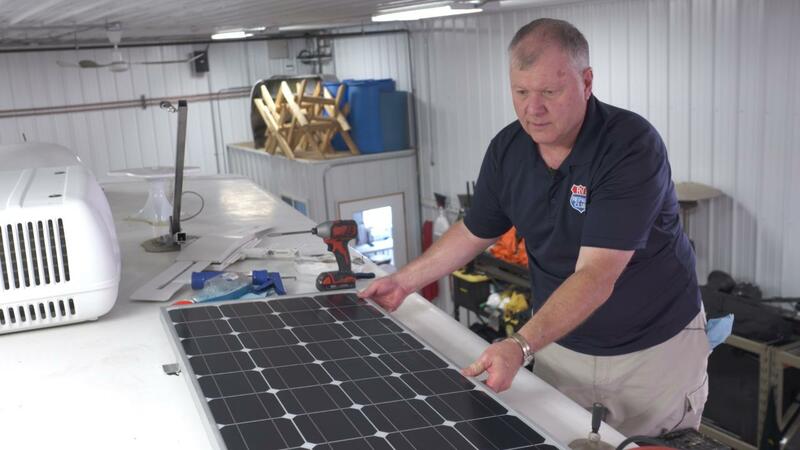 Finally, we’ll be working with an RVIA certified technician to install a solar system on an RV. We’re looking forward to teaching you how to capture the power of the sun! In addition to the detailed video instruction you’ll receive, this class will provide you with some downloadable resources and helpful information to keep, including a class guide you can follow and use as a reminder of the key points of the class instruction. NOTE: You’ll receive this Class video instruction in two forms: As on-demand streaming video (in your RV Account); and as a physical DVD, mailed to you. Dave Solberg is the Managing Editor of the RV Repair Club. 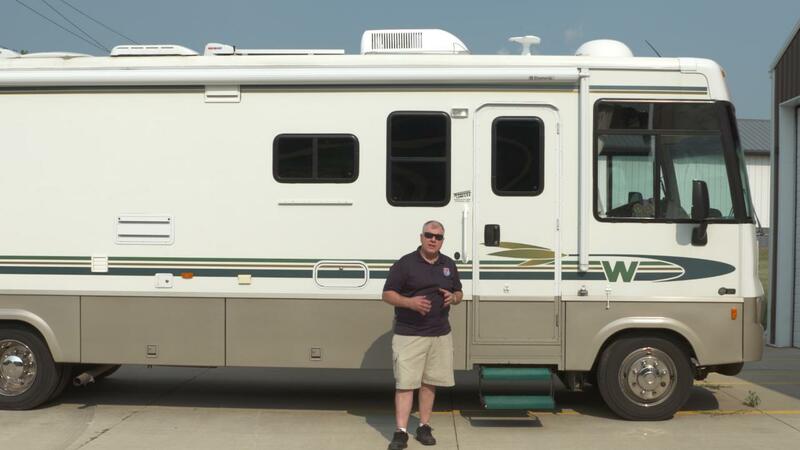 For over 25 years, Dave has conducted a wide range of RV maintenance and safety seminars, developed dealer and owner training programs, written RV safety and handyman articles, authored an RV handbook reference guide and logged over 100,000 miles on the road in an RV. Q: Download this short video to hear a few insights on this class instruction A: Every Class has a free Preview video you can watch, to give you a flavor of the Instructor and the skills or project that will be covered. In addition, the Overview tab includes a thorough written description of the Class. And finally, each Class Session has a brief written summary of the content in that Session, including the length of each Session video. You will get a good feel for the Class content by reviewing these resources. Q: Do I have to be a Member of RV Repair Club to purchase a Class? A: No you don’t. While Premium Members will receive regular offers for special deals on RV content, Classes are not reserved exclusively for Members. If you buy a Class as a non-member, we’re sure you’d also enjoy having access to our full library of great quilting videos and articles as a Member, so give it a try. Q: How do I access/view my Class? A: Once you’ve paid, you can access/view your Class by going to the MY ACCOUNT section of RV Repair Club. The MY ACCOUNT link is in the upper right-hand area of the website. Within your MY ACCOUNT, a section labeled “My Classes” will appear, including a link to watch the video of your Class. You’ll also receive an email confirmation after your purchase, which will include a link to view your Class. You can access your Class as many times as you wish, and you’ll never lose access to your Account information. Just be sure to “Log In” for access to MY ACCOUNT. Q: Can I view a Class on my tablet device or mobile phone? A: No problem. Most newer-model smartphones or other mobile/tablet devices with an internet connection are able to play the Class videos. Simply Log In on RV Repair Club, and you can view any Class you’ve bought through the MY ACCOUNT section. Or, you can click on the “View Class” link within the email confirmation you’ll receive upon your purchase. Q: How does the Class Q&A Resource benefit work? A: Once you purchase any Class, within the Class viewing page, you’ll have access to post a question, comment or tip in the Class Q&A Resource area. This is not a “live chat,” but your Class Instructor and RV Repair Club contributors will answer posted questions and provide tips regularly. You can also view other Class participants’ questions and input to take part in this virtual dialogue among others who have taken the Class and are willing to share tips, answers, or ideas. Q: Why do you need my email? A: We need it to acknowledge your purchase of a Class, and send you a confirmation of your transaction. Also, in order to maintain your permanent access to the Class videos, you’ll need to Login to www.rvrepairclub.com. We guarantee that we will not share your email with any third parties. You may receive email updates from RV from time to time, with details of new Classes and updates. You can easily unsubscribe when you receive any email. Q: Can I get a refund if I don’t like the Class? A: If your question is about the Class content, please use the Class Discussion benefit to ask your question online – and you'll receive feedback from the Class Instructor. Even your fellow Class participants may jump in to offer tips and advice from their experience. If you have other questions or need help, you can email us at RVRepairClub@program-director.net. or call us toll-free, at 1-855-706-3536. Service Representatives will be available Monday-Friday, from 8:00 AM to 4:30 PM Central time, excluding normal holidays. There has been a lot of excitement about solar power systems over the years. Whether you are looking for renewable energy solutions or just to extend your battery power for boondocking, it’s important to understand how a solar system works and how to configure one to best suit your needs. In this session, we will discuss the types of panels available, how a system works, how to select the right system for your needs and discuss the components in a system. The solar panel takes energy from the sun and transfers it into DC power to charge the batteries. A good analogy of a solar system is to compare it to a fuel system of a car. The solar panel is the fuel station, the controller is the shut-off valve, the cables are the fuel lines and the batteries are the fuel tank. In this session, along with our RVIA certified master technician, we will discuss how a solar system works. In order to choose the right solar system for your rig, you really need to take some time and look at how you are going to be RV’ing. The main reason you will be using solar is to charge the batteries when you are not able to plug into the grid. It boils down to using your batteries to run electronics inside the coach and how long you're going to need to run them. 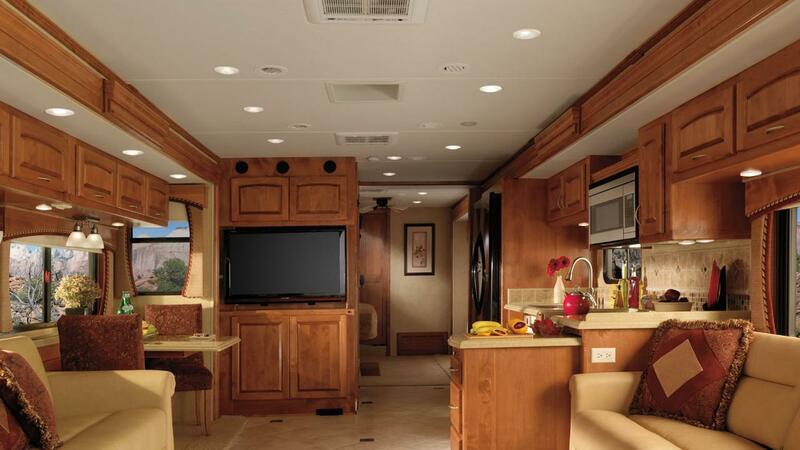 In this session, we will discuss the things that you should consider when selecting the system for your RV. One of the most important components in a solar system is the batteries because, after all, that's what you're trying to charge and to use as fuel to run the electronics inside your rig. 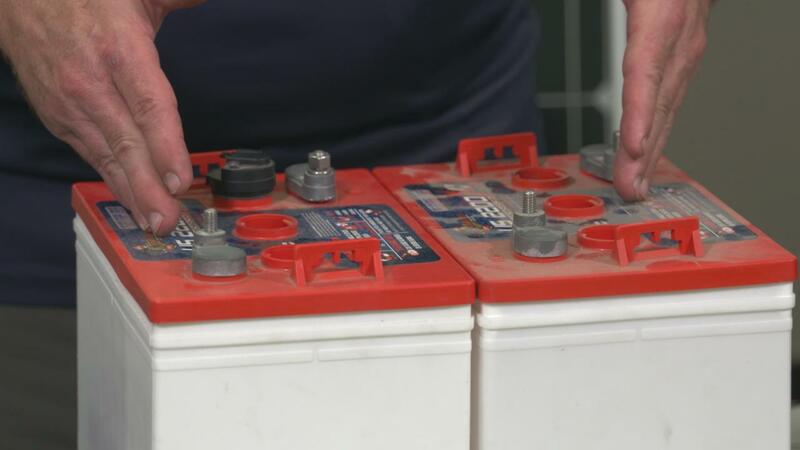 In an RV, you have a house battery that's going to be a deep cycle battery. That means it's designed to be drawn down to 10.6-volts, recharged to 12.6-volts and that cycle continues as you use electrical devices. There are two different battery voltages that are typically used in RV’s. 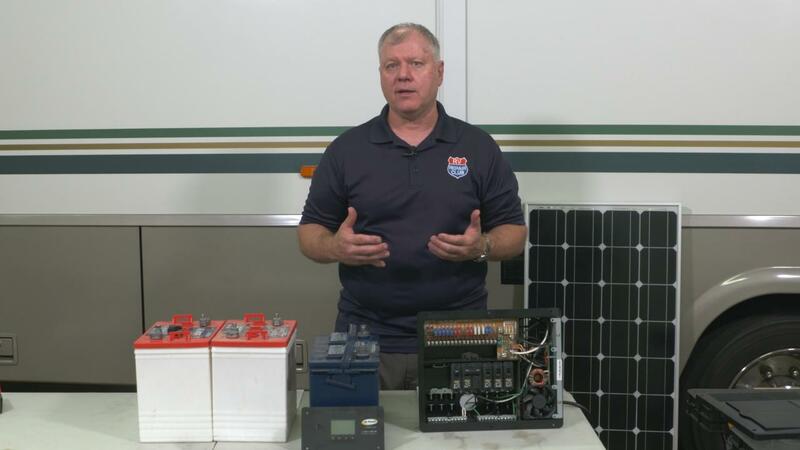 In this session, we’ll talk about all the types of batteries used in RV’s and how they are connected. If you're going to put a solar system in to charge your batteries and use them to run things inside, you're going to be limited to just those 12-volt appliances. You will only be able to use the interior lights and the appliances that run on LP with a 12-volt system and you won't be able to run a TV or any other 120-volt appliance with batteries. That's why a lot of people will put an inverter into their system. In this session, we will talk about the different sizes of inverters and how to select one for your solar power configuration. 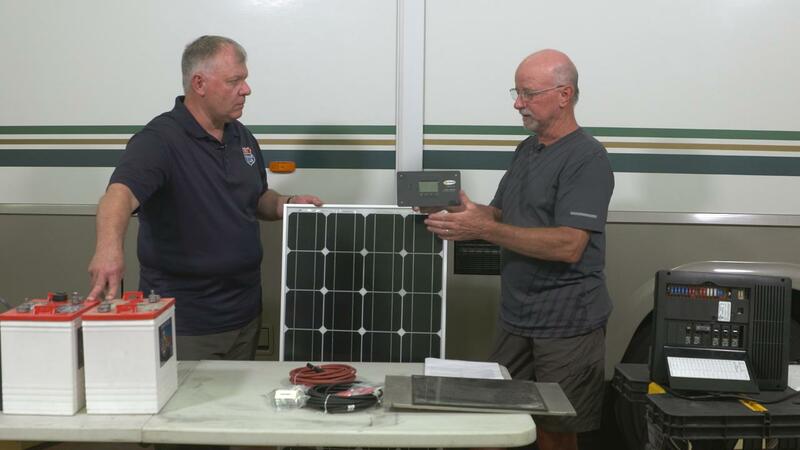 In this session, along with our RVIA certified master technician, we will install a solar system on an RV. We will show the first steps such as laying out all the parts, to prepping the roof for installation, and all the steps through to completion. During our installation, we’ll show you some tips and tricks to help you complete the installation successfully. Now that the system is installed, there are a few last steps to take to make sure that it is functioning properly. In this session, we’ll talk about the final steps and a few more things to consider such as storing an RV with a mounted solar panel and potential tax savings available.